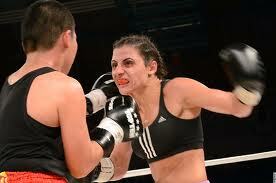 >>>UPDATE>>> Christina Hammer retains her WBF Women’s Middleweight Title! Christina Hammer improved her undefeated record to 12-0 by defeating Julie “Queen” Tshabalala by unanimous decision through ten rounds of boxing. The much shorter Tshabalala was said to have fought well inside, however, Hammer proved to be overpowering through out the fight. WBF Female middleweight champion, Christina Hammer, 21, is considered the number one women’s boxing middleweight fighting today. She will be putting it all on the line tonight in a championship bout at the Vodova Arena in Brno, Czech Republic. The naturalized German citizen by way of Kazakhstan, Hammer (11-0, 7-KOs) will be fighting her third title defense against South Africa’s own (4-1-1, 1-KO). Hailing from Johannesburg, Tshabalala is the current South African Middleweight champion and most recently defended her title against Lilian Molala WBF Female middleweight this past August 2011. Hammer is known for her tough, saavy fighting style and last October, handily defeated Vashon Living (5-1-0). This begs the question as to whether Tshabalala has the experience to be competitive in the ring against Hammer, although she is known for her tenacity in the ring. Susi Kentikian is still the WIBF, WBA and WBO Flyweight Champion! Christine Hammer retains WBO and WBF Middleweight Titles! Hailing from Germany by way of Kazakhstan, Christina Hammer (11-0, 7-KOs) put in another stellar performance by unanimously defeating of Vashon Living (5-2, 1-KO) of Houston, Texas. Living proved herself to be a tough competitor, but could not match Hammer’s strength and ring savvy. The judges scored the bout 100-90, 100-90 and 99-91. Ogleidis Suarez new interim WBA Female Featherweight Champion by split decision. Here’s the Susi Kentikian v. Teeraporn Pannimit Fight Video! Christy Martin’s back + a highly anticipated women’s bout 2night! Talk about a phoenix rising, the indomitable Christy Martin (49-5-3, 31 KOs) will be returning to the ring on June 4th in a rematch with Dakota Stone (9-8-5) @ the Staples Center in Los Angles. The six-round light middleweight bout will be Christy’s first in two years — and with a little luck and a lot of boxing savvy will be her 50th win. Check out the piece by Bob Velin in USA Today here. Christy’s fight is on the undercard of two much anticipated bouts: Julio Cesar Miranda’s (38-5-7, 5 KOs) WBO flyweight title defense against Brian Viloria (28-3, 16 KOs) and the battle for the WBC Middleweight belt between Sebastian Zbik (30-0, 10 KOs) and Julio Cesar Chavez, Jr. (42-0-1, 30 KOs). Christina Hammer (9-0, 7 KO’s) will be defending her WBO & WBF middleweight titles tonight against the reigning WIBA & WIBF light-middleweight champion Maria Lindberg (5-0-2) in a ten-round bout to be held in Usti nad Labem, Czech Republic tonight. Christina Hammer, 20, hailing from Germany will be fighting Sweden’s own Maria Lindberg, 34, in what will be an interesting bout given that Lindberg @ 5’5″ will be giving up 5″ in height & a weight class to the younger fighter. No media outlet has been announced though I’d guess it can be found on streaming video. The co-bout will be Lukas Koriechy vs. Hussein Bayram fighting for the WBO Super Welterweight Intercontinental Championship.